Stanford: Why did you pay triple? The minutes don’t say anything about other bids. The Owen bid is only $4,540. Besides mentioning asbestos – which is required by law – the only difference is Owen wasn’t planning on spreading grass seed. The Park bid charges $1,600 for that service. The bid the Village awarded the work to was $9,310.00 higher. Isn’t Mr. Park the Village Clerk’s cousin? The minutes don’t reflect the much lower bid even being considered. 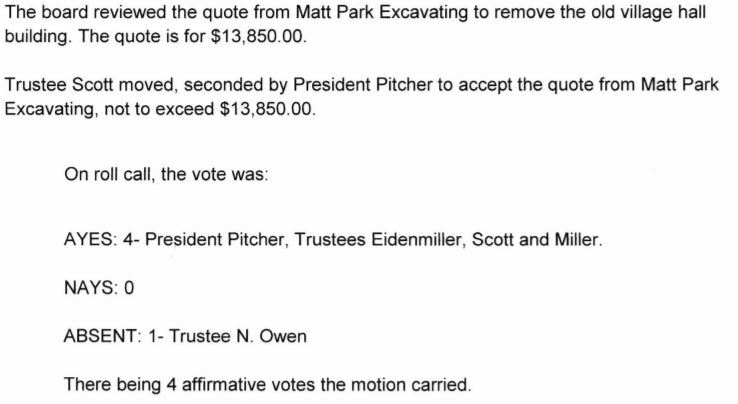 Did Matt Park Excavating check for asbestos before hauling the debris to the dump? His bid doesn’t say he did. I bet the IL EPA will be interested. The bank statement then also showed deposits of $19,182.38 when the monthly amount collected is less than $4000. Obviously somebody was scrambling to replace “borrowed” money because of my FOIA. This fund will NEVER collect enough money to build the plant, especially when the Village keeps “borrowing” from it. The missing money needs to be immediately replaced and then all money returned to the taxpayers. It doesn’t make sense to keep taking your money for something that will never happen. It also doesn’t make sense to leave the money in an account where it can be “borrowed” at will. Local elections are next April, petitions will be available at the end of this month. It sure looks like new people without an agenda or relatives who profit from Village business need to run for the Village Board! Posted in BloNo, elections, Local, Taxes.Tagged Sewer Fund, Village Hall demolition, Village of Stanford. Big time crooks in Chicago…small time crooks in small towns.